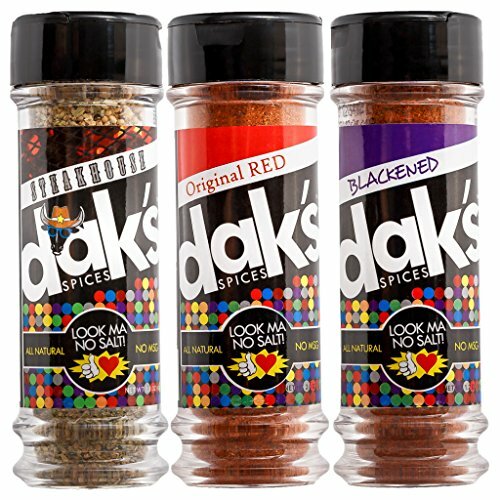 DAK'S SPICES "GRILL SET 3 PACK"
- Original Red: One of the best all purpose seasonings. A hand-mixed combination of pepper and various spices that will add flavor to any dish, without the salt. - Steakhouse: The perfectly hand blended spice containing crushed black peppercorns and herbs that gives a crunchy, flavorful coating to any steak. - Blackened: The perfect blend of herbs and spices to create that famous New Orleans Blackened Style. SAFETY WARNING: Produced in a facility that uses wheat, dairy, soy, egg, tree nut and fish ingredients. NO QUESTIONS ASKED 30-DAY MONEY BACK GUARANTEE! All natural, NO artificial additives. "They add great flavor to any meal and make an otherwise ho hum meal something really tasty!" Fire up your grill with DAK's delicious rub-worthy seasonings and spices and steak, poultry, fish. Cardiovascular-friendly foods to help lower that high blood pressure. Three delicious blends that will tantalize your taste buds. Go all natural, with no artificial ingredients! Salt/sodium free! MSG free! If you have any questions about this product by DAK's Spices, contact us by completing and submitting the form below. If you are looking for a specif part number, please include it with your message.